Major Winter Storm Underway In New Mexico! Regional Radar Snapshot @ 5:47 PM MST This Evening. 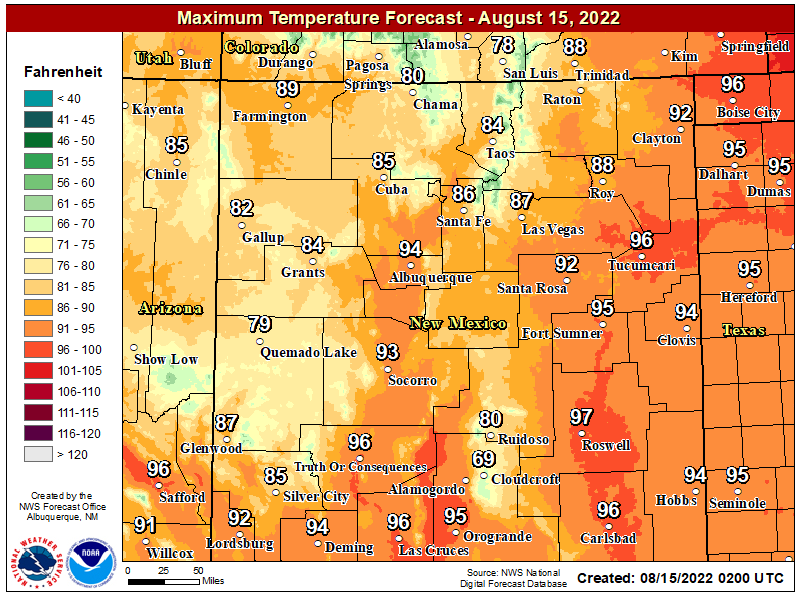 Valid @ 4 PM MST This Evening. 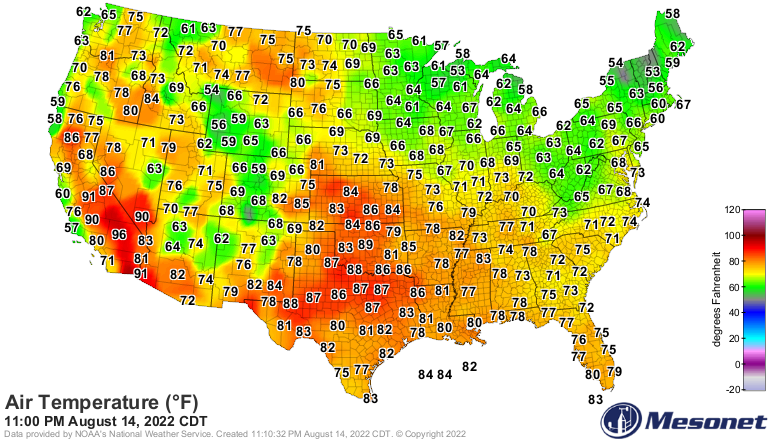 Valid @ 2 PM MST This Evening. So let's take a look at a couple of important features concerning our Major Winter Storm that is currently underway across Northern New Mexico. 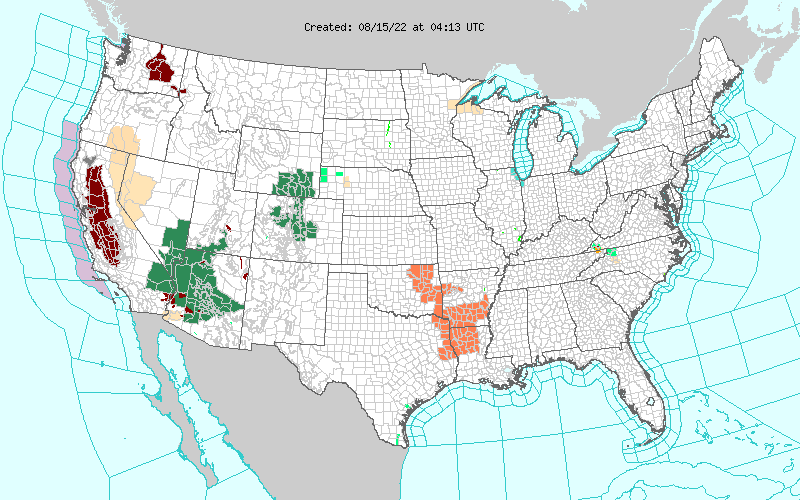 First where is the upper level storm located? 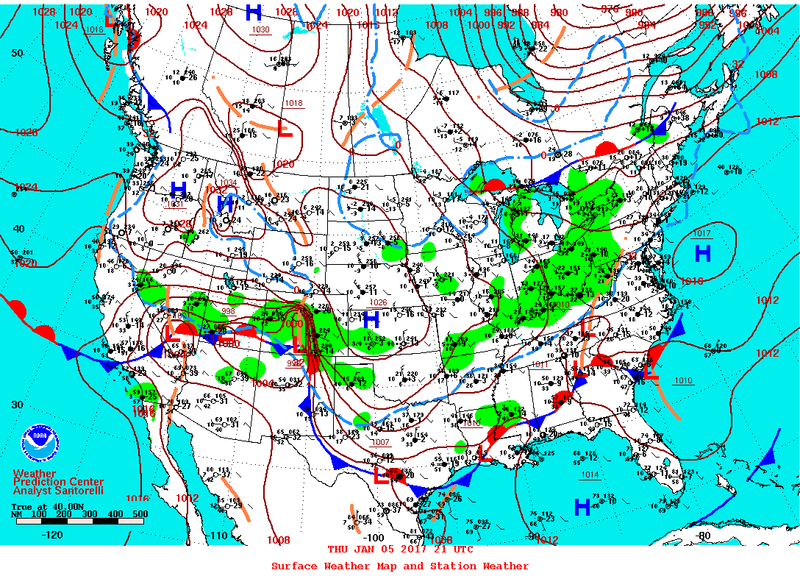 Looking at the RAP Mesoscale analysis chart at 500 millibars or at roughly the 18,000' level we find that it was located from Southern Oregon and Northern California eastward into Southwestern Wyoming at 4 PM MST this afternoon. When I loop the animation of the storm's progress I see that it is currently still digging southward or further westward than the models were forecasting yesterday and the day before. I'm not surprised at this because this happens fairly often. This can further be verified by the location of the surface area of low pressure over Southern Nevada with a secondary low over Southern Colorado this afternoon. 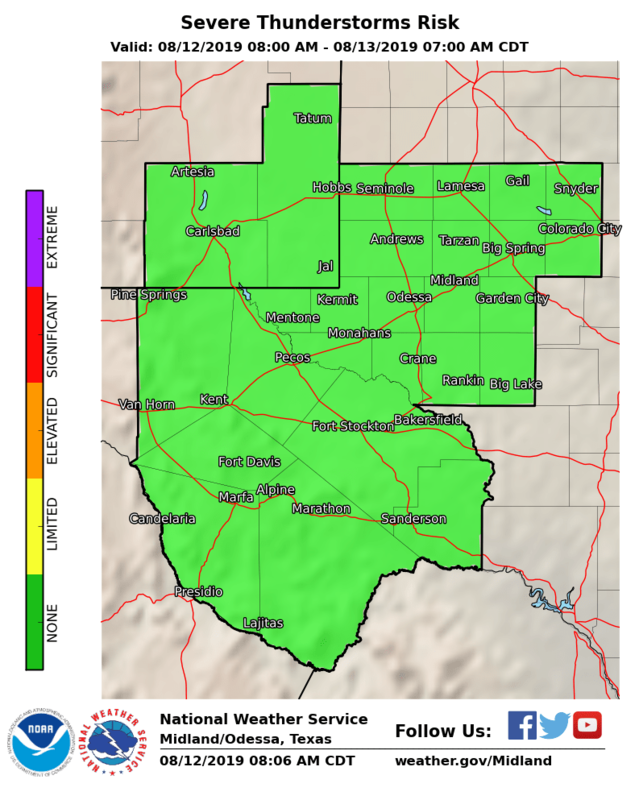 Again the further west and south the upper level short wave trough of low pressure digs the better the chances for snow over more territory of New Mexico including Southeastern New Mexico. The key to how much snow we end up getting will be the track of the storm...further west and south means more snow. 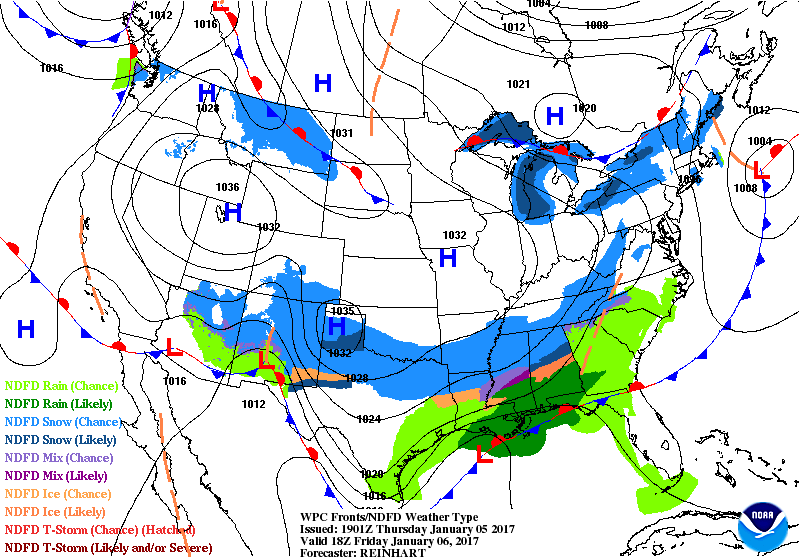 Valid @ 11 AM MST Friday, January 6, 2017. 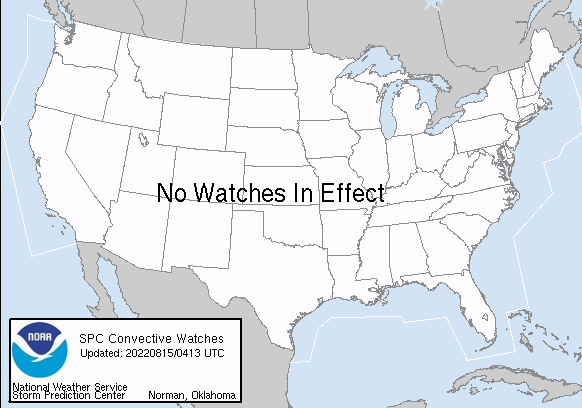 The forecasters at the Weather Prediction Center (WPC) are also picking up on this with their forecasts. Notice the surface low over Las Cruces with a secondary low near Yuma, Arizona by around noontime tomorrow. My gut and experience is telling me that this may be one of those surprise storms that drops more snow on Southeastern New Mexico than is currently being forecasts. Notice that their forecast map above shows a rain, freezing rain, sleet, snow mix for the local area by noontime tomorrow. 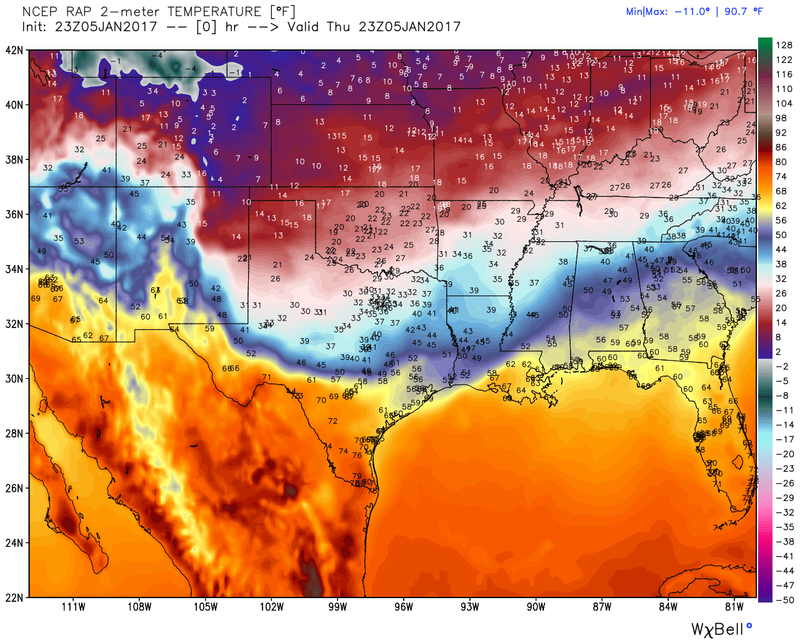 Valid @ 5 PM MST Sunday, January 8, 2017. 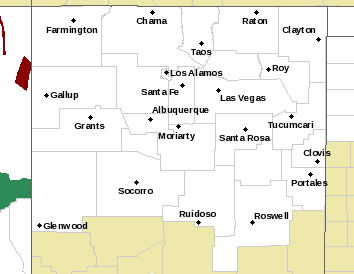 NWS Albuquerque Winter Storm Impact Severity Index. Valid @ 11 AM MST Sunday, January 8, 2017. 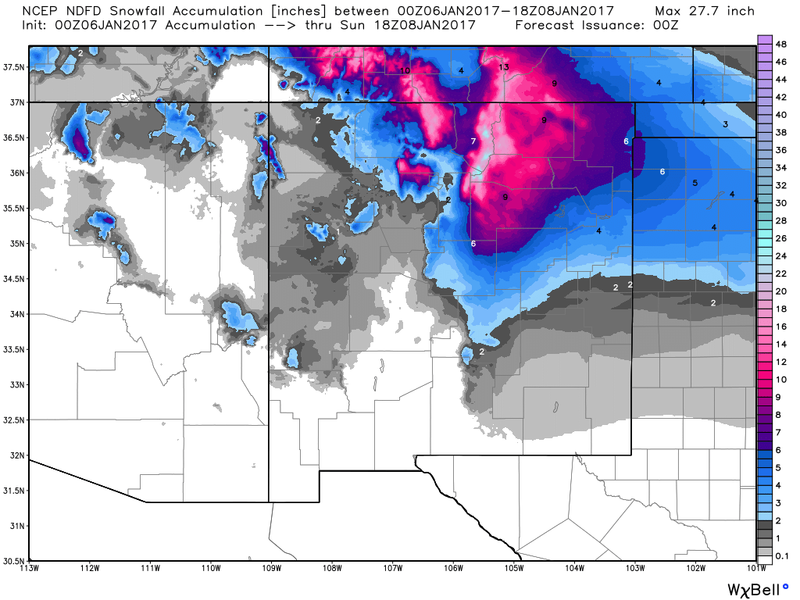 Current NWS forecasts are calling for an inch or two of snow in the Roswell area with a dusting over the rest of Southeastern New Mexico. 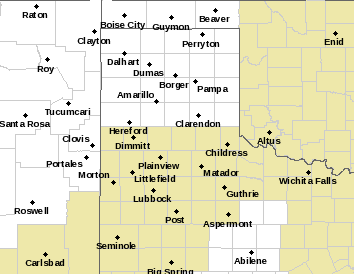 Maybe I'm totally wrong on this but I'll go ahead and climb out on that wobbly limb and say that I think we may see snowfall totals in Chaves, Eddy, and Lea Counties of 2" to 4" perhaps locally more by Saturday. 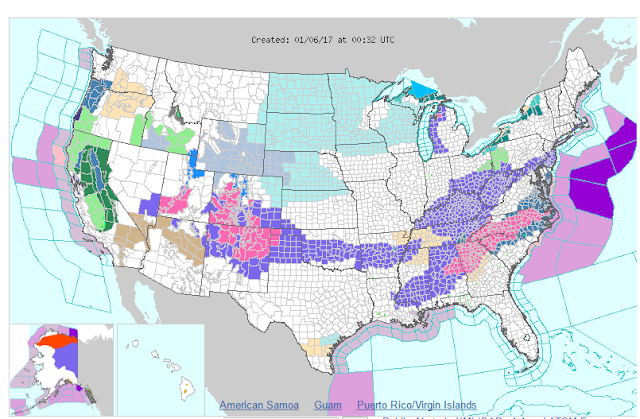 Its a rare and I mean rare occasion that I disagree with our local National Weather Service forecasts, but this is one of those times. 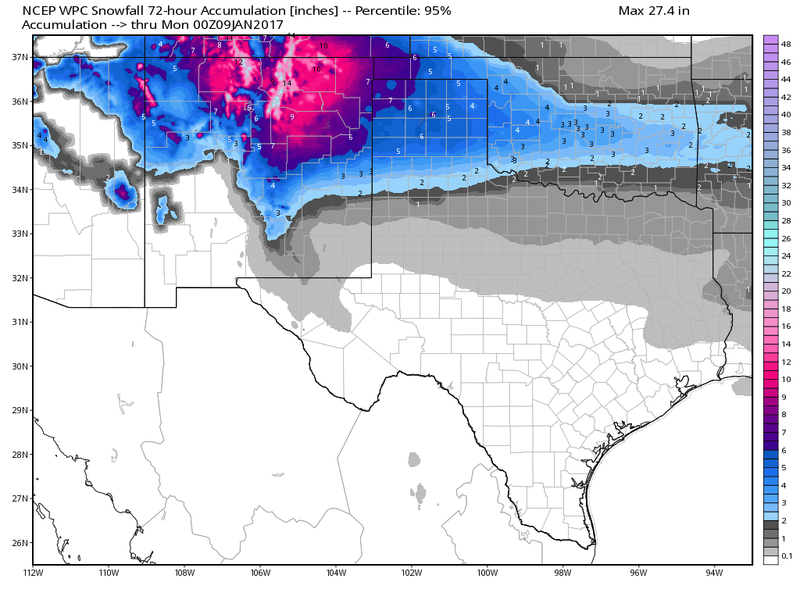 I also suspect that snowfall totals in the Sacramento, Capitan, and Guadalupe Mountains may also be greater than currently forecast. Maybe its because I am reminiscing about those surprise childhood winter storms when I was a kid that I remember going to bed and waking up the next morning to a half of a foot of snow on the ground. 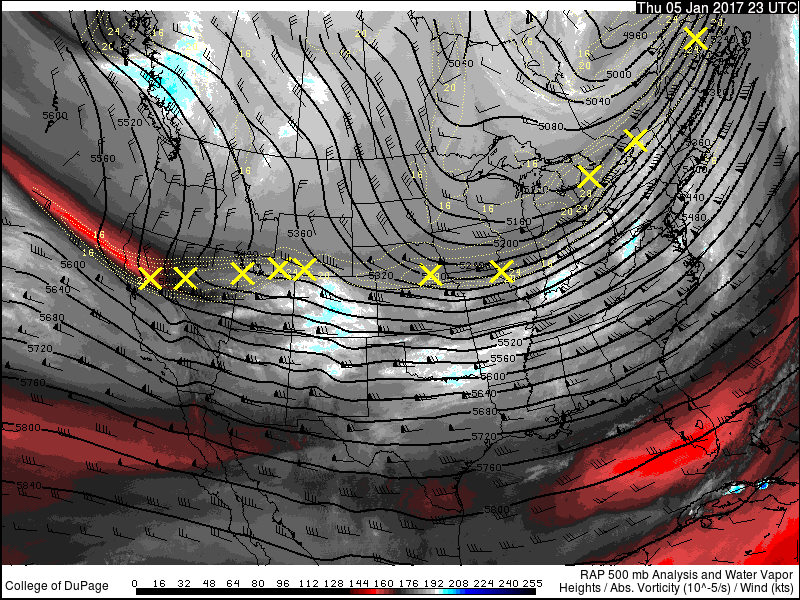 One thing that may keep this from happening though is the available surface moisture...which is somewhat lacking. Anyway we will soon find out right? 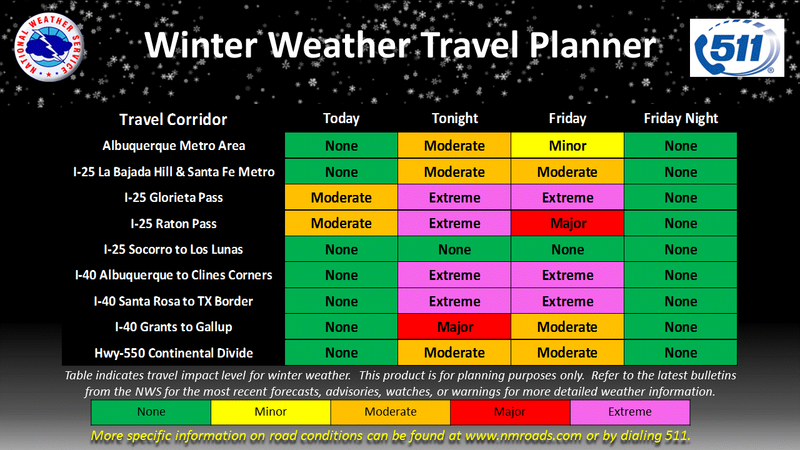 Travel anywhere across roughly the northern one half of New Mexico tonight into tomorrow night more than likely will be down right difficult if not dangerous or impossible. This will be especially true in the areas covered by the Winter Storm Warning! In some cases maybe even life threatening due to the snow, heavy snow, blowing and drifting snow and near zero visibilities!!! 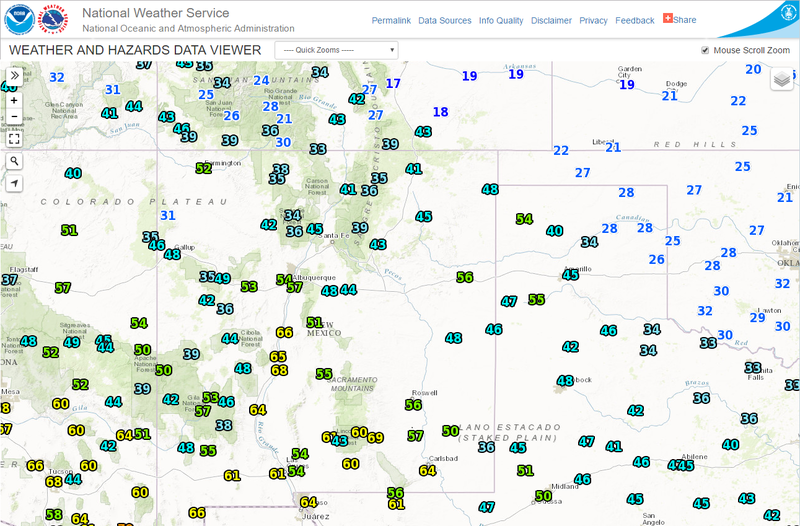 Wind chill values in these areas will dip below zero and some Northern New Mexico Mountain areas will be measuring snowfall totals in the feet by the time this storm comes to an end. Please stay abreast of all of our local road conditions via this link. 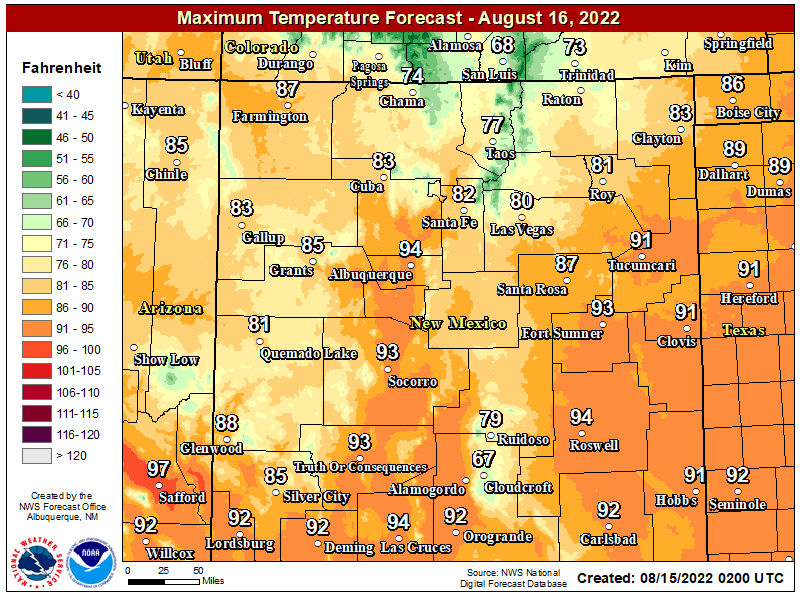 RAP Temperatures @ 4 PM MST This Afternoon. A pretty crazy day temperature-wise across the region. 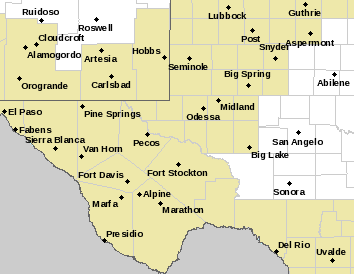 Notice the high temperatures 60's across Southern and Southeastern New Mexico and parts of West Texas with highs only in the teens in Southeastern Colorado. Now that's a pretty good depiction of an arctic cold front. Notice too at 4 PM it was 64ºF in El Paso, Texas and only 10ºF in Clayton located in far Northeastern New Mexico. 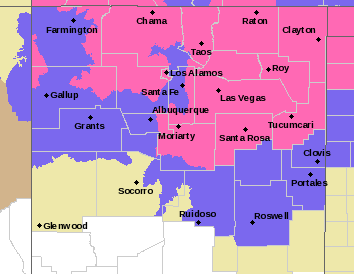 NWS Watches & Warnings In Effect As Of 6 PM MST. (Click On The Link Above For The Latest Information). 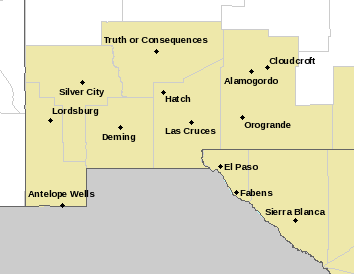 New Mexico NWS Watches & Warnings In Effect. 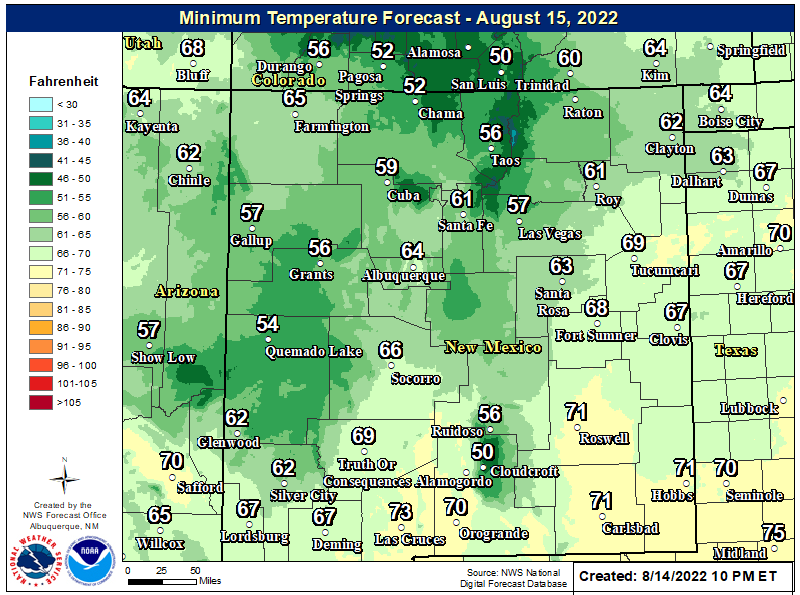 (As Of 6 PM MST This Evening). 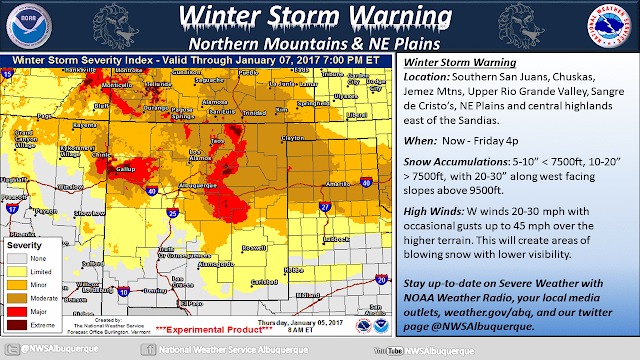 New Mexico Winter Storm Impacts. 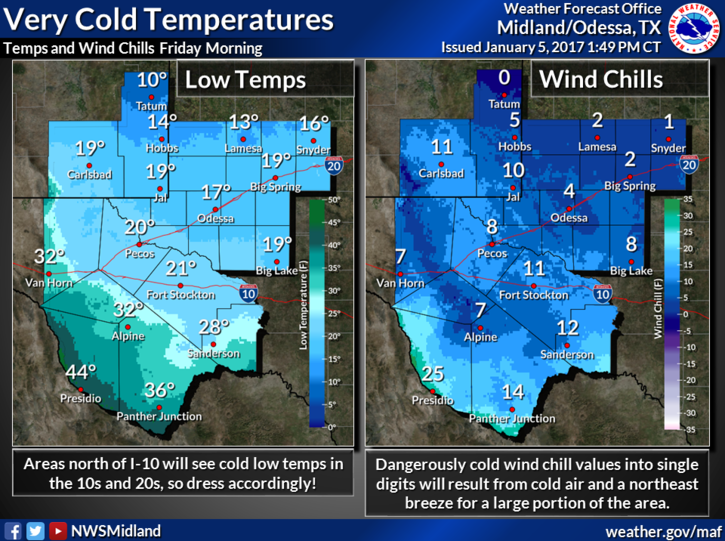 NWS Midland Forecast Temps & Wind Chill Values. With low temperatures dropping down into the teens tomorrow morning and wind chill values near zero to the single digits it certainly will feel like Old Man Winter has returned. And with forecast high temperatures struggling to get above 30ºF tomorrow afternoon the point will be further driven home. Saturday mornings low temperatures could very well be in the single digits and possibly even below zero in some locals...if we get snow tonight into tomorrow.